It’s a good idea to take a bike into uni, not only can you get extra exercise, but it’s faster than walking so you can sleep in a little more as well! So it’s important to make sure your bike is safe and secure, luckily we’ve got some tips from the Protection Service to help you out! Everyone knows that if you own a bike you need a bike lock, but there’s no point buying a £2 lock to protect your £200 bike. If you’re gonna get a lock make sure its a D-lock! D-locks are strong, sturdy locks that will keep your bike safe from thieves. You can usually pick them up pretty cheap at all bike shops. The National Cycle Database is where you can register your bike so that if it gets stolen the police can track it down more easily and recover it. All you need to do is go to the BikeRegister and sign up, give them your bike frame number, its make, model and what colour it is. After that, if your bike goes missing you can provide the police with its registration details and they can check to see if it has popped up anywhere. Registering your bike is an absolute must if you want a chance at getting it back if it gets stolen. Our very own university protection service has bike security roadshows throughout the year. At these you can get your bike checked, get some great bike security tips and you can purchase a D-lock for just £5! As well as all that, they can get your bike registered on the national database and can mark your bike with a UV kit to ensure that the bike is linked to you. The next bike security roadshow is on November 12th! So make sure you go down and get your bike secured! Also if you ever have questions about bike security just ask any of the protection officers walking around campus. Now you have the right lock, you’ve registered your bike and you’ve seen the protection service, the next thing is to make sure you lock your bike properly! When you lock your bike it’s not enough to just secure it by the wheel or the frame, you need to wrap the lock around both. Plus you need to make sure that the thing you’re locking it to is good and strong. Around campus there are plenty of bike stands that you can lock your bike on, make sure your brand new shiny D-lock wraps around the stand and goes through the wheel and frame of your bike. That way should anyone try to steal it they won’t just be able to take a wheel off and roll it away. 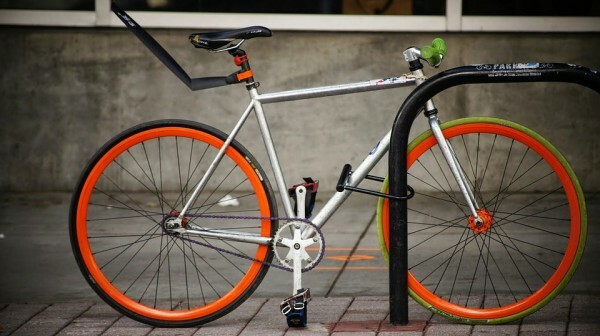 So make sure you follow these great security tips, and keep your bike safe from thieves!